This image is a combination of two pictures. One shows my brother sometime in the 1970's on his trail bike and against one of those beautiful red volcanic dust sunsets. I can remember yelling "get your bike, I'll get the camera." I took the "free spirit" picture at home on a hill behind the house. The other image shows two Clovis points I found on the Bostrom site some time in the 1970's or 80's. The trail bike is significant for the fact that he was riding it when he discovered the Bostrom Clovis site. He was riding cross county along a clear-cut path made for a, soon-to-be installed, electric transmission line. The Clovis site discovery was made when he stopped for a break on top of a hill that happened to be freshly plowed for the first time. 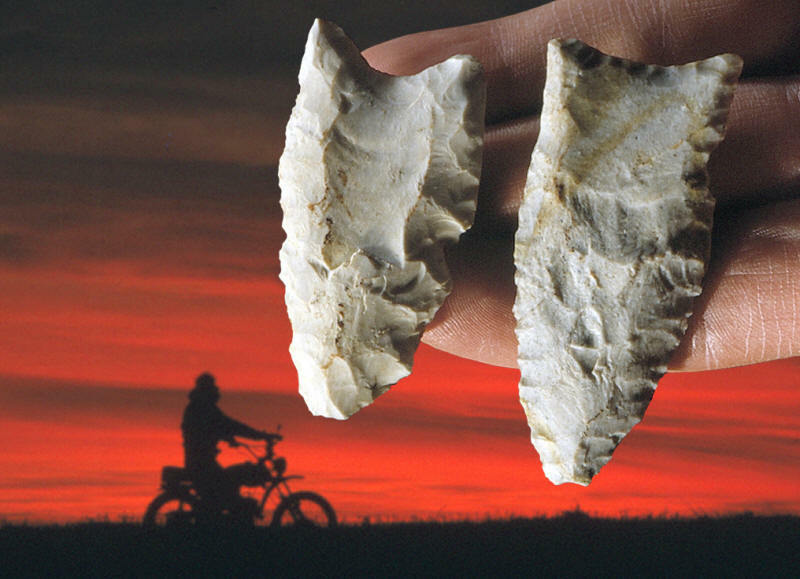 He got off his bike and quickly found three broken bases of Clovis points. We did report the site immediately to the local archaeology department. They took a look and verified that it was very important but couldn't do anything with it at that time. So we surface collected the site until houses were built and several vertical feet of the site was eventually removed to fill in a gully. Bob's discovery of the Bostrom site went on to include more than ten years of surface collecting, and an archaeological excavation. His unique find gave us (me and him) one of those fun life experiences you usually only read about. Both amature and professional archaeologists eventually worked on the site. The effort provided a considerable amount of knowledge to the local archaeological record about nomadic people who once pasted through this area 14,000 years ago. Bob was ten years younger than me, but as destiny seems to guide our lives, he died almost one year to the day as I write these words. He died from the proper use of a pharmaceutical drug that stopped his heart on 1-28-14.